In this week’s study from Tehillim / Psalms 112:1-10, the Psalm opens saying, א הַלְלוּיָהּ | אַשְׁרֵי-אִישׁ יָרֵא אֶת- יְהוָֹה בְּמִצְוֹתָיו חָפֵץ מְאדֹ: 112:1 Praise the Lord! How blessed is the man who fears the Lord, Who greatly delights in His commandments. (NASB) The Psalmist speaks of the one who delights in the commandments of God. Modern theologies teach that the Law is not a delight. Why would the commands cause one to have great delight? The psalm continues saying, ב גִּבּוֹרבָּאָרֶץ יִהְיֶה זַרְעוֹ דּוֹר יְשָׁרִים יְברָֹךְ: ג הוֹן-וָעשֶׁר בְּבֵיתוֹ וְצִדְקָתוֹ עמֶֹדֶת לָעַד: 112:2 His descendants will be mighty on earth; The generation of the upright will be blessed. 112:3 Wealth and riches are in his house, And his righteousness endures forever. 112:4 Light arises in the darkness for the upright; He is gracious and compassionate and righteous. (NASB) The concept here is that the one who fears the Lord, his descendants will be numerous and mighty on the earth. These people however will be upright ( יְשָׁרִים ) meaning they will walk to straight and narrow path of righteousness, justice, holiness, and truth. This kind of righteousness will endure through generations, because the godly man will teach his children the ways of the Lord. This kind of man the Psalmist says, 112:5 ד זָרַח בַּחשֶׁךְ אוֹר לַיְשָׁרִים חַנּוּן וְרַחוּם וְצַדִּיק: ה טוֹב אִישׁ חוֹנֵן וּמַלְוֶה יְכַלְכֵּל דְּבָרָיו בְּמִשְׁפָּט: It is well with the man who is gracious and lends; He will maintain his cause in judgment. 112:6 For he will never be shaken; The righteous will be remembered forever. (NASB) The idea is that the one who does charity (Tzedakah) which is derived from the Hebrew text meaning righteousness, fairness or justice. The psalm brings this into context saying, ז מִשְּׁמוּעָה רָעָה לֹא יִירָא נָכוֹן לִבּוֹ בָּטֻחַ בַּיהוָֹה: ח סָמוּךְ לִבּוֹ לֹא יִירָא עַד אֲשֶׁר-יִרְאֶה בְצָרָיו: 112:7 He will not fear evil tidings; His heart is steadfast, trusting in the Lord. 112:8 His heart is upheld, he will not fear, Until he looks with satisfaction on his adversaries. 112:9 He has given freely to the poor, His righteousness endures forever; His horn will be exalted in honor. (NASB) The psalm concludes saying, י רָשָׁע יִרְאֶה | וְכָעָס שִׁנָּיו יַחֲרקֹ וְנָמָס תַּאֲוַת רְשָׁעִים תּאֹבֵד: 112:10 The wicked will see it and be vexed, He will gnash his teeth and melt away; The desire of the wicked will perish. (NASB) In Judaism, giving to the poor is not viewed as a generous act; it is simply an act of justice, the performance of a duty, helping the poor. It is the right thing to do. The wicked are vexed because they do not understand such generosity. In this week’s study from Tehillim / Psalms 112:1-10, the Psalm opens saying, א הַלְלוּיָהּ | אַשְׁרֵי-אִישׁ יָרֵא אֶת-יְהוָֹה בְּמִצְוֹתָיו חָפֵץ מְאדֹ: 112:1 Praise the Lord! How blessed is the man who fears the Lord, Who greatly delights in His commandments. (NASB) The Psalmist speaks of the one who delights in the commandments of God. Modern theologies teach that the Law is not a delight. Why would the commands cause one to have great delight? In Tehillim / Psalm 37, we are told to “delight in the Lord” (37:4, ד וְהִתְעַנַּג עַל-יְהוָֹה וְיִתֶּן-לְךָ מִשְׁאֲלֹת לִבֶּךָ: ) and we are reminded of the need to delight in Lord God of Israel above all things. How do we express our delight in the Lord? It is one thing for us to hear the statements, “delight yourself in the Lord” (37:4), or as Paul wrote “rejoice in the Lord always” (Philippians 4:4), and it is quite another thing to actually do “rejoicing” or “delighting.” How do we delight ourselves in the Lord? Or more practically speaking, how do we rejoice in the Lord always? In the first ten verses of Tehillim / Psalm 40, we are given ways to express our delight in the Lord. David says, (i) we are to wait patiently for the Lord, (ii) we are to trust in the Lord, and (iii) we are to hide the righteousness of the Lord in our hearts. It is interesting to note how this psalm is written, David says, ח אָז אָמַרְתִּי הִנֵּה-בָאתִי בִּמְגִלַּת-סֵפֶר כָּתוּב עָלָי: ט לַעֲשוֹֹת רְצוֹנְךָ אֱלֹהַי חָפָצְתִּי וְתוֹרָתְךָ בְּתוֹךְ מֵעָי: 40:7 Then I said, ‘Behold, I come; In the scroll of the book it is written of me. 40:8 I delight to do Your will, O my God; Your Law is within my heart.’ (NASB) The Lord describes the scroll of the book as a reference to the Torah. David writes, “I waited patiently for the Lord; and He inclined to me, and heard my cry. He drew me up from the desolate pit, out of the miry clay, and set my feet upon a rock, making my steps secure.” (40:1-2). We delight in the Lord because He has inclined Himself to us. Note that this is because we have also inclined ourselves to Him, to seek Him according to His word in the Scriptures, and to pray. The Lord inclined Himself to David at a time when he was in the desolate pit and in the miry clay. We also were in the mire of sin, and the Lord called us out. Not only did the Lord draw us out of the pit of sin, but He also set us upon solid ground. The Lord secured our steps in order that we might never fall into the pit again. This closeness to the Lord that David describes flows from his godly fear that is coupled to his great delight in the holy commandments of God. This is how David describes the commands, as “Blessed is the man that fears the Lord, that delights greatly in his commandments” (112:1). This speaks of the idea that fear develops a sense of respect and reverence in the ways of God to sanctify and structure one’s footsteps, one’s life for the glory of God. This is the great delight in the commands, where the fear of God leads to one despising sin and having a great desire to turn from sin. It is not possible to delight one’s self in the commandments while at the same time holding onto the thing that is in opposition to God’s ways (disobedience). So for the man who delights in the mitzvot, his heart is transformed and thus his affection for sin is changed, where his heart is set upon the commands for the purpose of walking in God’s holy ways. This only possible by the indwelling of God’s Holy Spirit by our faith in Yeshua the Messiah. When a man sets his heart upon God’s holy ways, he is called “blessed.” It is from this fear that one loves and delights in the holy commandments. What matters most is that our obedience to the Lord God of Israel is always done as an expression of our delight in Him. This is why David says, “I delight to do Your will, O my God.” Yeshua stated in John 14:23, “If anyone loves Me, he will keep My word.” This is again why the one who fears the Lord and puts His words into practice is called greatly blessed! The psalm continues saying, ב גִּבּוֹר בָּאָרֶץ יִהְיֶה זַרְעוֹ דּוֹר יְשָׁרִים יְברָֹךְ: ג הוֹן-וָעשֶׁר בְּבֵיתוֹ וְצִדְקָתוֹ עמֶֹדֶת לָעַד: 112:2 His descendants will be mighty on earth; The generation of the upright will be blessed. 112:3 Wealth and riches are in his house, And his righteousness endures forever. 112:4 Light arises in the darkness for the upright; He is gracious and compassionate and righteous. (NASB) The concept here is that the one who fears the Lord, his descendants will be numerous and mighty on the earth. Why do you think the descendants of the righteous will be mighty on the earth? The Aramaic Targum states, ב גבר גיבר באוריתא יהוין בנוי בדר תריציא יתברך׃ ג מזלא מולא ועתרא בביתיה וזכותיה קיימא לעלמין׃ ד דנח בחשוכא נהור לתריציא חיננא ורחמנא וצדיקא׃ 112:2 His children will be mighty in the Torah, he will be blessed in the generation of the upright. 112:3 Luck and riches are in his house, and his merit endures forever. 112:4 Light dawns in darkness for the upright, gracious, and merciful, and righteous. (EMC) The Targum translates the children of the upright will be mighty in the Torah. 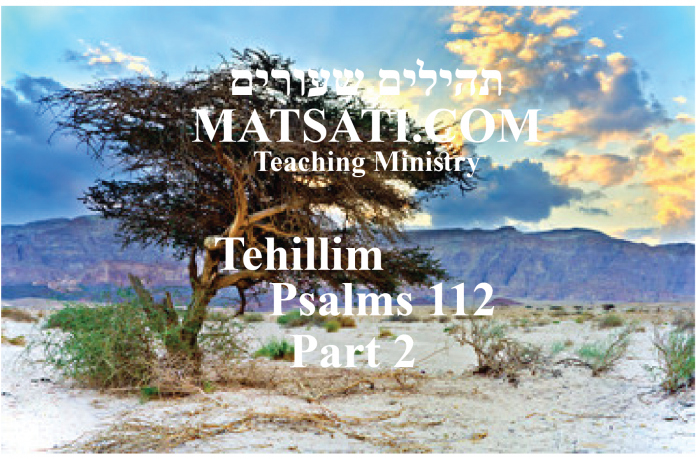 Rashi on Tehillim / Psalms 112:2 states, . דור ישרים אשר יבורך יהיה זרעו here Rashi focuses upon the “generation of the upright” ( דור ישרים ) this is the blessing that will be upon his children (seed). The blessing of God will fall upon those who seek to walk in His ways, to live for His glory, and to seek the benefit of others. The rabbis say the Gematria of ‘מכבים’, ‘Maccabees’, is 112, and thus makes reference to Tehillim / Psalms 112 which speaks of four things: (i) The God fearing (Matityahu) having mighty children (the Maccabees), (ii) the kindling of light (the Menorah) amidst the darkness, (iii) the everlasting remembrance of the righteous (Maccabees: why we celebrate Chanukah, until this very day), and (iv) the frustration of the wicked (Seleucid Empire) when their desire (Judean assimilation) falls out of their grasp. It is easy to see how the rabbis apply the Psalm to the Maccabees. It is also easy to understand how significant the concepts of the attack of the enemy, the salvation of God, and repentance (turning from sin and towards the righteous ways of the Lord) are being emphasized here in the Psalm. While thinking on the mightiness of the children of the upright, which is coupled to his righteousness that endures forever, we are reminded of the characteristics of God’s people, and of the Messiah. 1. The physical line through whom Messiah was to come included Gentiles. The blessings of the Abrahamic covenant extended to the Gentiles. In addition, in the genealogies, a few Gentiles were included in the messianic line, the line of the promised “seed.” The Tanach includes Gentiles (Tamar, Rahab,and Ruth) in the lineage of Messiah Yeshua. While Gentile women are included, never is a Gentile man included in the line. This gives one food for thought. 2. The coming “seed” was spoken of as a prophet, a priest, and a king. Moshe told the nation of Israel that God would raise up a prophet like him (Devarim / Deuteronomy 18:17-19). In Bereshit / Genesis 14:17-20 we are told Melchizedek whom the writer to the Hebrews believed was a proof text of the promised “seed,” the Lord Yeshua the Messiah (see Tehillim / Psalm 110:4 and Hebrews 7:1-28). Repeatedly through the Scriptures the “seed” is identifi ed as Israel’s king, who will sit on the throne of His father, David (see 2 Samuel 7:12-16, Tehillim / Psalm 2). The mightiness of the children of the upright, these things come about as a result of the man Yeshua living a righteous life. If we are His children by faith, these Scriptures speak prophetically of the people becoming the children of God. These people the Psalms speaks of however will be upright ( יְשָׁרִים ) meaning they will walk the straight and narrow path of righteousness, justice, holiness, and truth. This kind of righteousness will endure through generations, because the godly man will teach his children the ways of the Lord. The Psalmist continues saying, ד זָרַח בַּחשֶׁךְ אוֹר לַיְשָׁרִים חַנּוּן וְרַחוּם וְצַדִּיק: ה טוֹב אִישׁ חוֹנֵן וּמַלְוֶה יְכַלְכֵּל דְּבָרָיו בְּמִשְׁפָּט: 112:5 It is well with the man who is gracious and lends; He will maintain his cause in judgment. 112:6 For he will never be shaken; The righteous will be remembered forever. (NASB) The idea is that the one who does charity (Tzedakah) which is derived from the Hebrew text meaning righteousness, fairness or justice. Tzedakah is often translated as charity in Judaism and is a mainstay of Jewish life. The sages teach that the world was built upon kindness. However, tzedakah goes one step beyond. Literally translated as “justice” or “righteousness,” tzedakah tells us that sharing what we have with others isn’t just something special, it is the honest and just thing to do. In addition, Tzedakah is not limited to gifts of money but may also be performed by the sharing of our time with others, showing love in the same way the Lord has shown us love. Charity is a fundamental part of the Torah way of life, this is why the Targum translates 112:2 His children will be mighty in the Torah, he will be blessed in the generation of the upright. (EMC) Giving to the poor is an obligation in Judaism, a duty that cannot be forsaken even by those who are themselves in need. If these things are true, why then does Christianity not consider tzedakah obligatory? Some sages have said that tzedakah is the highest of all commandments, equal to all of them combined, and that a person who does not perform tzedakah is equivalent to an idol worshiper. It does not matter whether a limited amount of resources are provided to God’s people or whether wealth has been distributed unevenly in the earth. Some nations (or people) have given a greater share and some a lesser share. But since all are created equally in the image of God, there is a duty that develops from the Scriptures, that those people who “have” are to give of their substance to those who do not “have” in order to effect justice. This is the definition of tzedakah. It is a way of looking at the world and understanding the human role in helping others where by doing so one is imitating qualities of the Lord in heaven. Flee the evil desires of youth, and pursue righteousness, faith, love and peace, along with those who call on the Lord out of a pure heart. Don’t have anything to do with foolish and stupid arguments, because you know they produce quarrels. And the Lord’s servant must not quarrel; instead, he must be kind to everyone, able to teach, not resentful. Those who oppose him he must gently instruct, in the hope that God will grant them repentance leading them to knowledge of the truth. exercising our faith in the Lord God of Israel and in His Messiah Yeshua. Let’s Pray! The משל (mashal) “the parable,” goes on to explain the פתיחתא (Petihta), the rabbis speak of beauty and riches and how the Lord does not value either. The נמשל (Nimshal) “expansion on the parable” expands upon the משל (mashal), the rabbis continue saying a God fearing man is is whom the Lord loves and he will teach his children to walk in the ways of the Lord. • The משל (mashal) “the parable,” goes on to explain the פתיחתא (Petihta), the rabbis speak of obedience to the commands as not being compulsion. • The נמשל (Nimshal) “expansion on the parable” expands upon the משל (mashal), the rabbis expand upon the mashal speaking of some of the commands that Abraham, Isaac, and Jacob obeyed due to their love for the Lord God in heaven. א הללויה אשרי איש ירא [את] ה׳. זהו שאמר הכתוב שקר החן והבל היופי אשה יראת ה׳ היא תתהלל (משלי לא ל), אין הקב״ה מבקש לא יופי ולא עושר, אלא יראת חטא, שנא־ מר אשה יראת ה׳ היא תתהלל, כמו שנתהלל אברהם, שנאמר כי ידעתיו למען אשר יצוה [וגו׳ ושמרו דרך ה׳ לעשות צדקה ומשפט] (בראשית יח יט), וכתיב כי עתה ידעתי כי ירא אלהים אתה (שם בראשית כב יב), וכן הוא אומר כה אמר ה׳ אל יתהלל חכם בחכ־ מתו וגו׳ כי אם בזאת יתהלל המתהלל השכל וידוע אותי (ירמיה ט כב כג), ומי הוא המתה־ לל, מי שעוסק בתורה מאל״ף ועד תי״ו, ואין זאת אלא תורה, שנאמר וזאת התורה (דברים ד מד), אברהם שמר את התורה מאל״ף ועד תי״ו, שנאמר עקב אשר שמע אברהם בקולי (בראשית כו ה), לפיכך נאמר עליו המזמור הזה מאל״ף ועד תי״ו, ואף המזמור אשת חיל נאמר על שרה אשתו מאל״ף ועד תי״ו, שנא־ מר אשה יראת ה׳ היא תתהלל (משלי לא ל), [שניהם עשו את התורה מאל״ף ועד תי״ו]. 1. Praise the Lord. Blessed is the man that fears the Lord (Tehillim / Psalms 112:1). These words are to be considered in the light of the verse Grace is deceitful, and beauty is vain; but a woman that fears the Lord, she will be praised (Mishley / Proverbs 31:30). For the Holy One, blessed be He, values neither beauty nor riches, only fear of sin, as it is said, A woman that fears the Lord, she will be praised. So was Abraham praised, as it is said, For I have known him, to the end that he may command his children and his household after him, that they may keep the way of the Lord, to do righteousness and justice (Bereshit / Genesis 18:19); and again, For now I know that you are a God fearing man (Bereshit / Genesis 22:12). Scripture says also, Thus says the Lord, Let not the wise man be praised for his wisdom, But let him that is praised, be praised for this, that he understands and knows Me (Jeremiah 9:22-23). Therefore, who is to be praised? He who occupies himself with Torah from alef to tav. For this, in the words, let him be praised for this, clearly refers to Torah, as is said, And this is the Torah (Devarim / Deuteronomy 4:44). Now Abraham kept the Torah from alef to tav, as is said, Because Abraham listened to My voice (Bereshit / Genesis 26:5). Therefore, this Psalm, going from alef to tav, was composed about him. Likewise from alef to tav goes the Psalm A woman of valor (Mishley / Proverbs 31), composed about Sarah his wife, as it is said, A woman that fears the Lord, she will be praised. The two of them observed the Torah from alef to tav. The rabbis say that the man who fears the Lord is blessed, and this is to be taking into consideration with respect to Mishley / Proverbs 31:30, :ל שֶׁקֶר הַחֵן וְהֶבֶל הַיּפִֹי אִשָּׁה יִרְאַת-יְהוָֹה הִיא תִתְהַלָּל which speaks of Grace being deceitful. The Midrash states, “For the Holy One, blessed be He, values neither beauty nor riches, only fear of sin, as it is said, A woman that fears the Lord, she will be praised.” This concept of “fearing sin” is related to the fear of God and His judgment that would lead to death, paralleled to an eternal separation from His presence (Luke 12:5, Hebrews 10:31). The fear of the Lord God is having a reverence for the Lord and His ways. Hebrews 12:28-29 states, “Therefore, since we are receiving a kingdom that cannot be shaken, let us be thankful, and so worship God acceptably with reverence and awe, for our God is a consuming fire.” This reverence and awe is exactly what the fear of God means for His children. Solomon said in Mishley / Proverbs 1:7 The fear of the LORD is the beginning of knowledge. (NASB) Until we understand who God is and develop a reverential fear of Him, we cannot have true wisdom. The understanding of who God is comes by our living out our lives according to His Word. True wisdom comes only from understanding who the Lord God is by living out the commandments. This teaches us what it means by He is Holy, Just, and Righteous. Devarim / Deuteronomy 10:12, 20-21 ( יב וְעַתָּה יִשְרָֹאֵל מָה יְהוָֹה אֱלֹהֶיךָ שׁאֵֹל מֵעִמָּךְ כִּי אִם-לְיִרְאָה אֶת-יְהוָֹה אֱלֹהֶיךָ לָלֶכֶת בְּכָל-דְּרָכָיו וּלְאַהֲבָה אתֹוֹ וְלַעֲבדֹ אֶת-יְהוָֹה אֱלֹהֶיךָ בְּכָל־ לְבָבְךָ וּבְכָל-נַפְשֶׁךָ: … כ אֶת-יְהוָֹה אֱלֹהֶיךָ תִּירָא אתֹוֹ תַעֲבדֹ וּבוֹ תִדְבָּק וּבִשְׁמוֹ תִּשָּׁבֵעַ: כא הוּא תְהִלָּתְךָ וְהוּא אֱלֹהֶיךָ אֲשֶׁר-עָשָהֹ אִתְּךָ אֶת-הַגְּדלֹֹת וְאֶת-הַנּוֹרָאתֹ הָאֵלֶּה אֲשֶׁר רָאוּ עֵינֶיךָ: כב בְּשִׁבְעִים נֶפֶשׁ יָרְדוּ אֲבתֶֹיךָ מִצְרָיְמָה וְעַתָּה , (שָמְֹךָ יְהוָֹה אֱלֹהֶיךָ כְּכוֹכְבֵי הַשָּׁמַיִם לָרבֹ: 10:12 ‘Now, Israel, what does the Lord your God require from you, but to fear the Lord your God, to walk in all His ways and love Him, and to serve the Lord your God with all your heart and with all your soul, … 10:20 ‘You shall fear the Lord your God; you shall serve Him and cling to Him, and you shall swear by His name. 10:21 ‘He is your praise and He is your God, who has done these great and awesome things for you which your eyes have seen. (NASB) The fear of God is the basis for our walking in His ways, serving Him, and, yes, loving Him by reason of the manner in which He loves us and has delivered us again and again. The biblical definition of the fear of God, for the believer, includes understanding how much the Lord hates sin and fearing His judgment on sin even in the life of a believer. This is illustrated in the Apostolic Writings according to Hebrews 12:5-11 which describes God’s discipline of the believer. While it is done in love (Hebrews 12:6), it is still a fearful thing. Consider the life of David, it was said that David was a man after God’s own heart, but when he sinned, the punishment went either to himself, to his family, or to the nation of Israel. How important it is to watch and guard against sin in our lives. The Scriptures suggest our own personal sin could be affecting our immediate family by reason of God’s discipline in our lives. As children, the fear of discipline from our parents no doubt prevented some evil actions. The same should be true in our relationship with God, right? We should fear His discipline, and therefore seek to live our lives in such a way that pleases Him. The way this is accomplished is in His Torah which was lived out for our example in Yeshua the Messiah. Based upon the Scriptures, we have His promise that nothing can separate us from His love (Romans 8:38-39). We also have His promise that He will never leave us or forsake us (Hebrews 13:5). Fearing God means having such a reverence for Him that it has a great impact on the way we live our lives. The fear of God is respecting Him, obeying Him, submitting to His discipline, and worshiping Him and His awesomeness. The Midrash states in relation to fearing the Lord, “So was Abraham praised, as it is said, For I have known him, to the end that he may command his children and his household after him, that they may keep the way of the Lord, to do righteousness and justice (Bereshit / Genesis 18:19); and again, For now I know that you are a God fearing man (Bereshit / Genesis 22:12).” This fear led Abraham to teach his children of God’s ways, and in keeping them himself and teaching them to his children, Abraham demonstrated that he was a God fearing man. Does your life demonstrated you are a God fearing man or woman? The rabbis cite the following passage, “Thus says the Lord, Let not the wise man be praised for his wisdom, But let him that is praised, be praised for this, that he understands and knows Me (Jeremiah 9:22-23).” They speak of the words of Jeremiah. These things are expounded upon by the rabbis to say that the one who occupies himself with the Torah from lef to tav, this is what one is to be praised for. To be occupied with the Torah means that one is seeking to live in the kingdom of God according to God’s ways. It is interesting how the rabbis state that reading Torah from alef to tav is the method by which one is to occupy himself. The phrase “from alef to tav” is a phrase that may be familiar to some of us from the Apostolic Writings. Yeshua the Messiah testified in the book of Revelation 1:8 he says that he is the alpha and omega (a reference to the alef and tav), and in Revelation 22:13, he says this again that he is the alef and the tav. This is a reference to the First (Reshon) and the Last (Acharon), the Beginning (Rosh) and the Ending (Sof). When Yeshua was making these statements, he was referencing Isaiah 41:4, 44:6, and 48:12. According to the prophet Isaiah, Adonai Himself says that He is the First and the Last, and explicitly declares that there are no other gods besides Him. Yeshua as Masihach (Messiah) was declaring that it is through him all the nations of the earth would be redeemed, for those who would have faith in him. It is interesting to note that the Hebrew word Emet ( אמת ) for truth begins and ends with Aleph and Tav. The Hebrew word Emet is more concrete than the English word for truth in which the English word is derived from the Greek or Western view of truth. Based upon “the Torah,” from a Hebraic mindset, the one who exercises emet (truth) is one who can be trusted (see Bereshit / Genesis 24:49, 42:16, 47:26, Joshua 2:14). Based upon the Torah, our actions reports what we say, and God’s judgments are emet (truth) because they are reliable. In the Tanakh, emet is often coupled with Chesed (Mercy/Grace), covenant faithfulness, which designates God’s loyalty in fulfilling His promises that are based upon His covenant. Both Emet and Chesed were revealed in the giving of the covenant at Sinai according to Shemot / Exodus 34:6. Based upon these words from the Torah, truth (emet) is deeply personal. It is an integral component of HaShem, and is not something that is objective or static that is studied only at a distance. It is a personal disclosure of the character of a person. The reason being, when we know the truth about something, we learn something deeply personal about what was in a persons heart. When emet is understood in this way, truth is a way of living, a mode of existence, that is deeply connected to relations and interactions, and what we do in the midst of one another (husbands, wives, brothers sisters, neighbors, and our enemies). Midrash Tehillim 112, Part 1 concludes saying, “Therefore, this Psalm, going from alef to tav, was composed about him. Likewise from alef to tav goes the Psalm A woman of valor (Mishley / Proverbs 31), composed about Sarah his wife, as it is said, A woman that fears the Lord, she will be praised. The two of them observed the Torah from alef to tav.” When Yeshua declared himself to be the alef and tav, he was speaking of who he is in a deeply personal manner. He is the Messiah, He is the One in whom we receive redemption, He is our Savior, He is the right hand of the Lord God of Israel who did, has, and will deliver His people from all things, including from the failings of sin and rebellion. In John 14:6, Yeshua spoke of being “The truth, and the life.” This is coupled to the thought of His being the Way through which men come to the Father, where declaring himself to be the truth and the life is understood to mean that in Him the Father is revealed to men, that He is the Eternal Truth, and that He is the Source of eternal life. (compare: John 1:14 John 1:17 John 6:50-51 John 11:25-26) Remember that He lived out the Torah for our example and in doing so, we recognize his character of righteousness, justice, truth, and love. This is the characteristic of the Messiah, the One through whom would bring the mediation of salvation, to go before God, and to make the request of the people known before our Father in heaven, just as Moshe functioned. Yeshua does not merely point out the way and teach the truth and bestow life. He claimed to be “the way, the truth, and the life,” so that by attaching ourselves to Him in faith, in this way one may possess the truth and the life. “The way” that is referred to here is being the way to the Father and the way of the Father. He is the goal as our example and Messiah where there is but one way to the Father, “no one comes,” καὶ ἡ ἀλήθεια, “and the truth,” are primarily about the Lord God of Israel and His righteous and holy ways. The way to Him is led by the Messiah who leads his people in holiness and righteousness which provides us with all knowledge which is what leads us to life everlasting by faith, what is required for life. Midrash Tehillim 112, Part 2 opens with the Dibur Hamathil ( דיבור המתחיל ) saying, “Blessed is the man that delights greatly in His commandments (Tehillim / Psalms 112:1).” The פתיחתא (Petihta) the homiletic introduction to the midrash states, “For Abraham kept the commandments not under compulsion, but with delight, as is said, That delights greatly in His commandments.” What does it mean to delight greatly in His commands? The Apostle Paul wrote to the Philippians 4:4 Rejoice in the Lord always; again I will say, rejoice! (NASB) Is this what it means to be joyful in all that we do? To rejoice in the Lord always is not primarily a matter of feeling, but of obedience. Paul speaks in Philippians 4:4 a commandment, which is repeated twice for emphasis, so that we will not shrug it off. The motivations of our hearts is to deliberately be happy and to deliberately choose to obey, especially when we are in difficult circumstances. The delighting greatly in the mitzvot (commandments) has to do with our attitudes which are directly related to our mental attitudes in our choices. Many times, the choice to rejoice often goes directly against how we feel. Considering Job and what had happened to him, when we go through trials, when we are treated unfairly, when we are disappointed by people or circumstances, even when disasters or great calamity occurs, we are faced with a decision. Will we continue to obey this commands and to rejoice in the Lord or will we allow ourselves to be swept along by our feelings? ב במצותיו חפץ מאד. שלא עשה את המצוה באנגריא, אלא בשמחה, שנאמר במצותיו חפץ מאד, אמר לו הקב״ה לך לך מארצך (בראשית יב א), לא עשה באנגריא, אלא וילך אברם כאשר דיבר אליו ה׳ (שם שם בראשית י״ב ד), ויקח אברם את שרי אשתו וגו׳ (שם שם בראשית י״ב ה), א״ל הקב״ה המול ימול (שם בראשית יז יג), ומל מיד, בעצם היום הזה נמול אברהם (שם שם בראשית י״ז כו), אמר ליה קח נא את בנך וגו׳ (שם בראשית כב ב), מיד וישכם אברהם בבוקר (שם שם בראשית כ״ב ג), חפץ לעשות מצוה בזריזות [וכשנולד יצחק בן שמונת ימים הגישו למילה, שנאמר וימל אברהם את יצחק בנו בן שמונת ימים (בראשית כא ד) והגישו (למנחה) [כמנחה] על גבי המזבח, ועשה שמחה ומשתה, מכאן אמרו חכמים חייב אדם לעשות שמחה ומש־ תה באותו היום שזוכה למול את בנו, כאבינו אברהם, שנאמר ויעש אברהם משתה גדול ביום הגמל את יצחק (שם שם בראשית כ״א ח)], הוי במצותיו חפץ מאד, ומה שכרו, גבור בארץ יהיה זרעו, זה יצחק, שנאמר כי ביצ־ חק יקרא לך זרע (שם בראשית כא יב), ומה גבורתו, ויעתר יצחק לה׳ וגו׳ (שם בראשית כה כא), ואין זה גבור שעשה לעקרה שתלד. דבר אחר גבור בארץ. זה יעקב, שנאמר (ועתה) [ואתה] ישראל עבדי (ישעיה מא ח), ומה גבורתו, וישר אל מלאך ויוכל (הושע יב ה) נטל את המלאך ורפשו לארץ. דור ישרים יבורך [ואיזה דור ישרים], כל אלה שבטי ישראל (בראשית מט כח). 2. Blessed is the man that delights greatly in His commandments (Tehillim / Psalms 112:1). For Abraham kept the commandments not under compulsion, but with delight, as is said, That delights greatly in His commandments. Note that when the Holy One blessed be He, said to him, you are to get out of your country (Bereshit / Genesis 12:1), he did not go under compulsion, but instead willingly went, as the Lord had spoke unto him (Bereshit / Genesis 12:4), and took Sarai his wife (Bereshit / Genesis 12:5). When the Holy One blessed be He said to him he that is born in your house must be circumcised (Bereshit / Genesis 17:13), he circumcised himself forthwith. In the self same day was Abraham circumcised (Bereshit / Genesis 17:26). When God said to him Take now your son and offer him for a burnt offering (Bereshit / Genesis 22:2), straight away, Abraham rose early in the morning, and saddled his donkey, and took Isaac his son (Bereshit / Genesis 22:3), for Abraham delighted to do God’s commandment speedily. And after Isaac was born and was born and was eight days old, Abraham presented Isaac for circumcision, as is said, And Abraham circumcised his son Isaac when he was eight days old (Bereshit / Genesis 21:4), and in presenting him thus as an offering upon the altar, he prepared a joyous feast. From this the Sages interpreted that it is the duty of a man to prepare a joyous feast on the day that he is privileged to circumcise his son, even as our father Abraham had done, for it is said, And Abraham made a great feast Hence it is said, Blessed is the man that delights greatly in His commandments. And what was Abraham’s reward? His seed will be mighty upon earth (Tehillim / Psalms 112:2), his seed referring to Isaac, for it is said In Isaac will seed be called to you (Bereshit / Genesis 21:12). And where was Isaac’s might? Isaac entreated the Lord for his wife, because she was barren (Bereshit / Genesis 25:21), and is he not mighty whose entreaty results in a barren woman’s bearing a child? A different comment on His seed will be mighty upon earth, His seed refers to Jacob, to whom it was said, But you Israel, My servant (Isaiah 41:8). And wherein was Jacob’s might? He strove with an angel, and prevailed (Hosea 12:5) that is, he lifted up the angel and threw him to the ground. The generation of the upright will be blessed (Tehillim / Psalms 112:4). Who are the generation of the upright? These are the generation of the upright? These are the twelve tribes of Israel (Bereshit / Genesis 49:28). The rabbis the delight in the commands to Abraham who was not under compulsion to obey. Note how this is the same in our case, obedience to the commands are because of our great love for the Lord! The example of Abraham was “When the Holy One blessed be He said to him he that is born in your house must be circumcised (Bereshit / Genesis 17:13), he circumcised himself forthwith.” This is quite the example, since it is related to the cutting of the flesh, painful, and not something that one just does on a whim. This demonstrates his love for the Lord and his desire to be connected to the most high taking a form of physical separation from the world. Note that circumcision is not something of public display. This is related to something that is very “private” which illustrates for us the significance of the intimate nature of the commands in our lives, that are related to our relationship with God. Note what the author of the book of Hebrews writes, 4:12 For the word of God is living and active and sharper than any two-edged sword, and piercing as far as the division of soul and spirit, of both joints and marrow, and able to judge the thoughts and intentions of the heart. 4:13 And there is no creature hidden from His sight, but all things are open and laid bare to the eyes of Him with whom we have to do. (NASB) The word of God creates a dividing line between the soul and the spirit, and reveals the intentions of the heart. Can you see the intimacy that is created in our understanding of who we are and our nature when we seek to live our lives according to God’s Word? This is the process of maturing and growing up in God’s Word to live for Him by examining the intentions of our hearts. This is how delighting in the mitzvot (commandments) is related to our attitudes which are directly related to our mental attitudes in our choices. The choice to obey and to rejoice in doing so goes directly against how we feel, note the connection to the Midrash and the example of Abraham, circumcising himself which would go contrary to how he would feel. The act of circumcision at the age of 70 years old is not a pleasant thing to do. The rabbis continue saying the following: When God said to him Take now your son and offer him for a burnt offering (Bereshit / Genesis 22:2), straight away, Abraham rose early in the morning, and saddled his donkey, and took Isaac his son (Bereshit / Genesis 22:3), for Abraham delighted to do God’s commandment speedily. And after Isaac was born and was born and was eight days old, Abraham presented Isaac for circumcision, as is said, And Abraham circumcised his son Isaac when he was eight days old (Bereshit / Genesis 21:4), and in presenting him thus as an offering upon the altar, he prepared a joyous feast. The idea is that when the Lord told Abraham to offer his son as a sacrifice, that he obeyed right away. This was paralleled to when Isaac was born, he was circumcised on the eighth day, which is synonymous to Abraham presenting him as a sacrifice, and an offering unto the Lord. The midrash states that following this Abraham prepared a joyous feast. To rejoice in the Lord always is an attitude of contentment and hope that transcends our circumstances. This joy in the Lord which we must aim for is not a superficial happiness based on circumstances or on the absence of trials, but rather is a solid contentment and hope that is as steady and certain as our faithful God who has given us His promises in His Word. Yeshua demonstrated this attitude as He faced death on the cross (John 15:11, 17:13). The apostles knew what this meant when they were flogged for preaching the gospel, and we are told that they went on their way “rejoicing that they had been considered worthy to suffer shame for His name” (Acts 5:41). Paul and Silas knew that joy when they were unjustly thrown in the Philippian jail, note how they sang hymns of praise to God (Acts 16:25) regardless of their circumstance. Also note how many martyrs died singing praises in the flames as their enemies gloated. Joy is a fruit of the Holy Spirit and the Tanach and the Apostolic Writings are filled with men who obeyed God’s commands regardless of the circumstance (see Tehillim / Psalms 5:11, 33:1, and 64:10). Therefore the commands are a matter of obedience and not a matter of temperament. Note how Isaac entreated the Lord for his wife because she was barren (Bereshit / Genesis 25:21). He prayed on behalf of his wife, he was not angry with her for her inability to have children. This demonstrates how his compulsion to pray for his wife was out of love for her, and not based upon her ability to have children. The same example may be given from Abraham and Sarah. The generation of the upright, as the children of Abraham, will live their lives for others in this same manner, and realizing that doing so is synonymous to living for the Lord God our Father in heaven and for His Messiah Yeshua. Let’s pray! Next articleBits of Torah Truths, Parashat Vayak’hel/Pekudei, פרשיות ויקהל-פקודי, What is the Meaning of Mixed Threads?